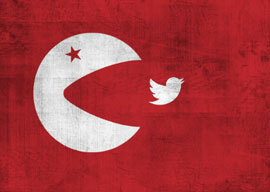 Last week, Turkey decided to ban Twitter. The move was a reaction to supposed evidence that had spread on the website purporting to corroborate allegations of corruption within Turkish Prime Minister Recep Tayyip ErdoÄan’s inner circle and family. He has been in a combative mood for a few weeks about social media sites, recently proclaiming: “We will wipe out all of these. The international community can say this, say that. Everyone will see the power of the Turkish Republic.” I strongly suspect that he is correct in saying that, but I”m not sure that he”ll regard the words as ideally chosen when he reminisces on all this. Whether or not his alleged motives are true, it seems remarkable that a Western democracy in 2014 can believe this to be a good move. It’s particularly surprising, as Turkey tried a similar tactic in 2008 when it banned YouTube for hosting videos deemed offensive to modern Turkey’s founder, Mustafa Kemal AtatÃ¼rk. (It is a crime there to insult his memory.) The ban was lifted in 2010, with Turkey’s transport minister (who oversees the Internet) declaring: “I hope that they have also learned from this experience and the same thing will not happen again.” Right back at you. The ongoing tensions in Turkey are deeply troubling for a number of reasons. They reflect”magnified”the tensions between traditional values and those of modern liberal societies. Some might regard this as a Western/Islamic clash, but the truth is that strict conformists of any number of world religions have similar issues (although they”re less widely commented upon), and liberalism in society”particularly youth cultures”is by no means a purely Western phenomenon. In Turkey, however, three specific factors combine to aggravate the population’s sensitivity to such matters: a vibrant youth scene, the country’s geographical proximity to so many Middle Eastern conflicts, and the secular nature of its society as enshrined in the constitution that AtatÃ¼rk established. The acrimony over moves by Mr. ErdoÄan’s government perceived to be prejudicial to Turkey’s secular society has polarized a political scene that was until recently relatively stable (bearing in mind that the last successful military intervention there was in 1997). This was all extensively reported during the demonstrations in Taksim Square last year. The corruption allegations are a part of the continuing campaign to undermine and ultimately oust the prime minister, who nowadays seems to many to be becoming ever more dictatorial and threatening to Turkey’s status as a modern secular state. Given that, it is even more remarkable that he has decided to outmaneuver his opponents on this issue by trying further to censor the Internet. Predictably, uproar has ensued online and global attention has once again been drawn to issues that had started to fade in the collective memory since last year’s clashes. The greatest focus of the current surge is, of course, on Twitter, which is still accessible via SMS in Turkey. One particularly memorable Tweet read (in translation): “I hope this implementation won”t last long.” Not memorable? Look at the Tweeter: Abdullah GÃ¼l, the Turkish president. It’s like trying to catch water in a net. Which is torn. And soluble.